Habitat : Northern and south western india. 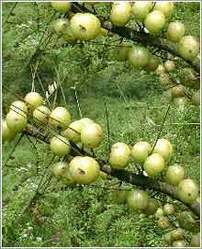 Uses : Emblica Officinalis or Amla is aperient, carminative, diuretic, aphrodasiac, laxative, astringent and refrigerant. It is the richest known source of vitamin 'C'. It is useful in anaemia, jaundice, dyspepcia, haemorrhage disorders, diabetes, asthma and bronchitis. It cures insomnia and is healthy for hair. It is considered as one of the most rejuvenating drugs, imparting a long healthy life and weight gain. It also acts as an antacid and antitumorganic agent.